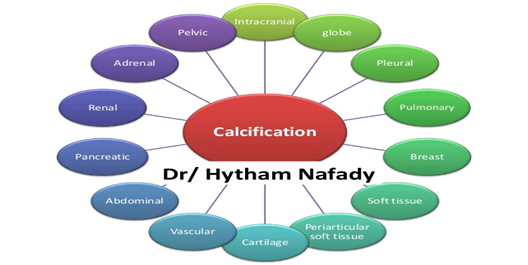 Calcification occurs as a result of calcium buildup in body tissues. Overtime, the buildup can harden and disrupt normal bodily processes. Calcification can occur in almost any part of the body, as calcium is transported through the blood stream. About 99 percent of calcium in the body is transported to teeth and bones. The remaining one percent dissolves in the blood. However, a variety of disorders can cause the remaining one percent to travel to other areas of the body. This one percent can add up and cause problems over time. Treatment may be required to prevent related complications. In some cases, calcium buildup is harmless and may be considered a normal part of aging. However, calcification can disrupt organ function and affect blood vessels. Genetic or autoimmune disorders that affect the skeletal system and connective tissues. Vitamin K2 deficiency or by poor calcium absorption due to a high calcium/vitamin D ratio. Intake of excessive Vitamin D can cause Vitamin D poisoning and excessive intake of calcium from the intestine. X-rays are the most common diagnostic tools used to detect calcification. Blood tests may also be ordered for people with kidney stones. This test can help determine your overall kidney function and determine whether an infection is present. Ultrasonography: On sonograms, Kidney/Renal stones are demonstrated as bright echogenic foci. While calcium deposits are not always a sign of cancer, people with calcification may be tested for cancer at the site to rule it out. Your doctor will order a biopsy to collect a tissue sample through a fine needle. The sample will then be sent to a laboratory for testing. 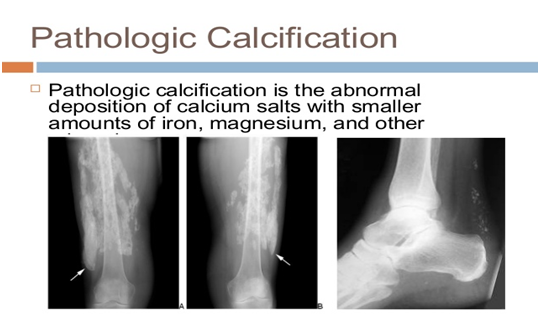 Treatment for calcification will depend on where calcium deposits occur, their underlying cause, and what, if any, complications arise. Once you are diagnosed with calcification, regular follow-up with your doctor will be required to spot potential complications. Minor cases of calcification in the arteries aren't considered dangerous unless the valves start constricting. In this case, you may need surgery to open the valve or replace it altogether. Treatment of high calcium/vitamin D ratio may most easily be accomplished by intake of more vitamin D if vitamin K is normal. Intake of too much vitamin D would be evident by anorexia, loss of appetite, or soft tissue calcification. 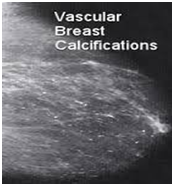 Breast calcifications are calcium deposits within breast tissue. They appear as white spots or flecks on a mammogram and are usually so small that you can't feel them. They're especially prevalent after menopause. Although breast calcifications are usually noncancerous (benign), certain patterns of calcifications such as tight clusters with irregular shapes may indicate breast cancer. The radiologist will recommend additional testing if the calcifications can't be seen well or their cause is unclear. The radiologist may recommend a six-month follow-up for another mammogram to see whether the breast calcifications have changed in appearance or whether they're stable or unchanged. Salivary stones form when chemicals in the saliva accumulate in the duct or gland. They mostly contain calcium. Factors contributing to less saliva production and/or thickened saliva may be risk factors for salivary stones. Use of certain medications (such as antihistamines), blood pressure drugs, psychiatric drugs, and bladder control drugs. Trauma to the salivary glands may also raise the risk for salivary stones. It results from calcium deposits settling in and around the joints. Calcium salts sticking to the synovial membranes or moving surfaces of a joint rougher than these highly sensitive surfaces cause the joint to become inflamed and make movements very painful. As the build-up progresses, mobility of the joint decreases until finally the deposits on the two joint surfaces come together to fuse the joint. This process of fusion is called ankylosis. At this stage, there will no longer be pain since there is no more movement in the joint. acid (DSA and RNA) which break down first into purines and then into uric acid. The next step, which is the breakdown of uric acid into allantsin, which can pass through the kidneys, requires the enzyme uricase. Humans do not have uricase; only carnivorous animals, such as cats, dogs, and omnivorous animals, such as hogs and rats (the scavenger animals) have it. Uric acid passes through the kidneys at a very slow rate, causing it to build up in the blood stream and stick in crystal form to the arteries and veins, and also form stones in the kidneys. Once the uric acid crystals provide a roughened surface, a combination of calcium salts and cholesterol will stick to it, forming the atherosclerotic plaque that clogs the artery like boiler scale in a water pipe. In advanced cases, the arterial wall weakens and deteriorates, and calcium deposits reinforce it but make the artery stiff and brittle. Before this stage is reached, narrowing of arterial opening causes high blood pressure as the heart pumps more strongly to move blood through the system. Calcium deposits also occur in the veins, mainly in the valves of the veins that prevent back flow of blood to the feet when the person is in a standing position. This shows up as varicose veins and swelling in the legs, and is also part of the pathology of phlebitis. Calcification can also occur in the glands. The gland most apt to be noticeably effected by calcification is the prostate in middle-aged and older men. Calcium can accumulate in the middle ear, interfering with the movements of the three small bones that transmit sound impulses from the ear drum to the sound receptors in the inner ear, causing hearing loss. Calcification, or sclerosis of nerve sheaths results in neurological disorders; senile dementia is related to calcification in the brain. danger of fracture. The dentin of the teeth also becomes demineralized and prone to decay. We all know that your physiotherapist is an expert in the prescription of exercise appropriate to you and your injury or fitness level. As a part of their physiotherapy training, your physiotherapist not only is educated in injury diagnosis but also in exercise physiology or the science of exercise. This enables your physiotherapist to not only assess and diagnose your injury but also to prescribe injury, fitness or age-appropriate exercises targeted to you at that point in time. It is also important to understand that even if you are "in good shape," you may have important but weak localized or stability muscles. When you have an injury, you should perform specific exercises that specifically strengthen the muscles around your injury and the adjacent joints. Your physiotherapist will assess your muscle function and prescribe the right exercises specific for your needs. Would You Stop Your Daily Prescription Drugs? When your physiotherapist prescribes your individualized dose or exercises, they are using their professional expertise to optimize your exercise dose. Don't stop taking your regular blood pressure medications. Exercise when prescribed by an expert such as your physiotherapist should be treated as your mandatory dose as prescribed by your physiotherapist. Just like when you don't take your blood pressure medication, you can't expect the drugs to work of you don't take it as prescribed by your health professional! So, next time you skip your "exercise dose" just remember that you are not putting your health first.If you have any questions, please contact your Physio Works physiotherapist for your best care. Regular exercise and physical activity are important. You will feel better mentally and physically. You will keep your skin, muscles, heart and lungs in healthy. You will maintain your strength and circulation. You will lessen the side effects of your treatments. Exercise regularly, stop smoking, reduce high blood pressure, get proper amounts of rest, reduce stress, control weight and maintain social interaction, along with a proper diet and medication, to build a healthy vascular system. gland, it causes faster degeneration. This compound can also decrease melatonin production, reducing one's ability to get deep, restorative sleep. Besides contributing to one's lack of divine recognizance, calcification of the pineal gland has shown to be in strong correlation with the development of Alzheimer's disease. In addition to a diet laden with preservatives, chemicals, pesticides, calcification and premature aging often both result. How should one Eat to Prevent Premature Aging and Calcification? Quite simply (though not as simple to adopt), a healthy, preservative/chemical-free diet that is rich in healthy fats, fruits, vegetables, high-enzyme legumes, nuts, seeds, and leafy green foods should be implemented. While it may be difficult to cut it out completely (unless you move to a remote location with pure, spring water), drastically lowering the fluoride levels consumed will positively benefit your health and mission to de-calcify the essential endocrine gland. Properly filtering water before consumption. Most communities have water supplies teaming with fluoride. To properly filter, you need a reverse-osmosis filter on the tap. It is also an option to buy bottled water from a clean, fresh spring. Switching to fluoride-free toothpaste. Many commercial toothpaste companies add fluoride to their products. While the debate on its efficiency or necessity rages on, it has been shown to be another form of toxic input that you don't need. Purchased organic and with the mother, Apple Cider Vinegar is a great tonic to detoxify and de-calcify the body. It is rich in malic acid and helps alkalize the body. You can sip this vinegar 3 times a day, or add it to a glass with water, lemon juice, and honey. Iodine-rich foods, such as seaweed, kelp, cranberries, green beans, kale, darky leafy greens, bananas can help support thyroid function which is essential for the pineal gland. While the list is incomplete as there are far more sources of iodine-rich foods, their importance cannot be overstated. The delicious, mineralizing, and highly-prized raw cacao bean (which chocolate is derived from) is abundant in antioxidants that fight free radicals and keep the brain healthy. Raw cacao a 7th chakra food has also been touted to stimulate the mind's eye and help detoxify it. Highly prized by indigenous Indians throughout South and Latin America, who really needs an excuse to consume this food anyways? This incredibly healing food nourishes all parts of the human body. But its greatest benefit may be that it revitalizes the brain and detoxes the pineal gland. Rich in medium-chain triglycerides which are converted to ketones in the liver, this food restores neurons and improves nerve function in the brain. This is incredible news for those seeking alternative form of therapy to reverse damage in the brain and prevent Alzheimers disease. Nature offers many preventative and healing herbs. Herbs are helpful in healing the body and de-calcifying. Light reflected by the retina stimulates the pineal gland. Because our eyes need to be exposed to indirect sunlight on a daily basis, sporting sunglasses at all times can contribute to calcification of the pineal gland. If sunglasses are an essential must in your life, at least take breaks from wearing the sunglasses and spend plenty of time in the sun. Because many people are deficient in Vitamin D, getting enough through sun exposure can not only support your brain health, but also help fight depression. Water: Drink 6 glasses of reverse osmosis water per day. Vitamin K1 and K2: vitamin K can actually regress preformed calcifications. The health implications for humans are significant. Liquid Vitamin K2 : Vitamin K2 activates a protein hormone called osteocalcin, produced by osteoblasts, which is needed to bind calcium into the matrix of your bone. Osteocalcin also appears to help prevent calcium from depositing into your arteries. Lack of vitamin K2 causes calcium to fail to be deposited in bones and instead ends up in the arteries, aorta and other parts of the body. vessels, which make the body produce more cholesterol to fill the cracks. Vitamin C keeps the blood vessels strong, reducing circulating cholesterol, while also clearing the inner walls of fat deposits. Long-term vitamin C deficiency can lead to weak arteries prone to calcification. Magnesium Citramate : Massive calcium intake without adequate magnesium can cause calcium to deposit in the soft tissues. Magnesium acts as a guardian at calcium channels and allows a small amount in for electrical transmission and then rejects the rest. It reduces soft-tissue calcium and calcified plaque, and dilates coronary arteries and peripheral vessels, helps prevent blood clotting, and improves irregular heartbeats. Liquid Vitamin D3 : Optimize vitamin D levels in the sunshine to work synergistically with vitamin K.
Below is an IDEAL sample Diet Plan. Make sure to check the correct portion sizes for each food item. Talk to your doctor or dietician about any restrictions on fluid or water intake. Do not add SALT or SUGAR while cooking or as seasoning.